HÀ NỘI — The capital city will conduct a thorough inspection of the management and use of land in Mỹ Đức District’s Đồng Tâm Commune, particularly in the Đồng Xanh area where a plan to build the Miếu Môn Airport is under way despite residents’ objections. The announcement was issued on Thursday by the chairman of the Hà Nội’s People’s Committee Nguyễn Đức Chung at a dialogue with 100 representatives from Đồng Tâm Commune. The dialogue was an opportunity for the city leader and local representatives to exchange views and try to understand each other as they seek common ground on this sensitive land issue. However, for many reasons, including the fact that it was late in the day and the commune is 22km away from the city centre, the dialogue did not iron out all the problems as expected. Chairman Chung said he would continue to hold talks with local residents today or tomorrow. 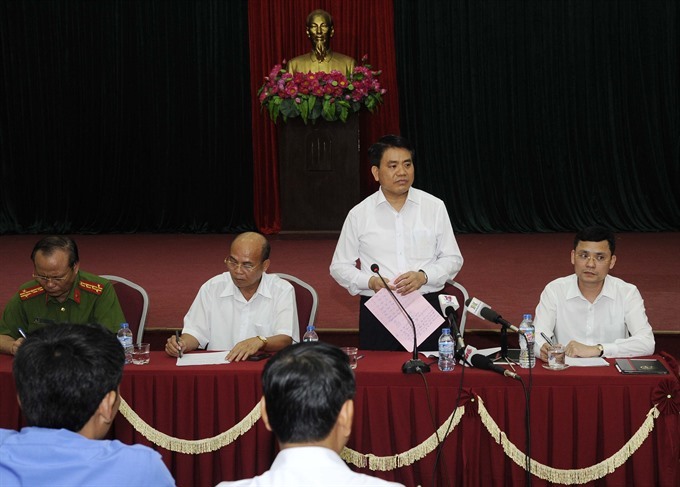 Also present at the meeting were representatives from the National Assembly’s Ombudsman Committee, the Government Inspectorate, the Ministry of Public Security, the Mỹ Đức District authorities and the media. Chairman Chung promised to focus on solving the problems as quickly as possible. He said the city had asked Viettel Telecom Corporation to stop construction, as well as other activities, to facilitate the inspection work. Inspections will be conducted seriously focussing on reviewing all issues, including past offenses, and strictly punish individuals and organisations for violations, according to Chung. Chung also urged residents to promptly remove piles of sand, bricks and others construction materials at the exits and entrances to Hoành and Đồng Tâm communes, and avoid damaging social security and order. The city leader recognised that in the past days, local people have not behaved too badly to 38 officers and soldiers they held hostage, 15 of whom have so far been released. Responding to questions by reporters, Vice Chairman of Đồng Tâm Commune People’s Committee, Phạm Hồng Sỹ, said this was a serious incident affecting local activities. People are now aware that the Đồng Xanh area is agricultural land belonging and they deserve compensation, said Sỹ. Therefore, local people all have a common desire for the city authority to intervene to clarify who is right and who is wrong.